Luis Rodriguez is one of thousands in Miami protesting and voting against #Venezuela's President's plans to change their constitution. Long lines and high temperatures didn't dampen the spirits of those waiting outside the University of Miami's Watsco Center. Venezuelan flags were seen everywhere in the two voting locations in Doral. People in line cheered at the sight of the Venezuelan flag outside of the UM's Watsco Center. Venezuelan voters wait in line at the Miami Dade College West campus in Doral. Voters walked into the Watsco Center in Coral Gables to lines of tables where they could sign in and vote. Volunteers distribute water to people waiting in line in Doral. More than 100,000 Venezuelans gathered in Miami-Dade, Broward and Palm Beach Counties on Sunday to vote against president Nicolas Maduro's efforts to change the country's constitution. "I am here supporting my people. 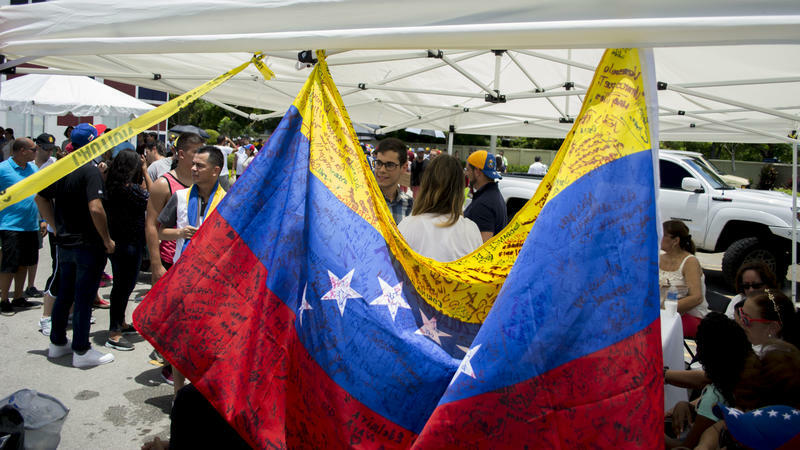 I have been here [in the U.S.] for 25 years but Venezuela is still in my heart and I want to see change," said Alejandro Heredia, 36, from Maracay and now living in Doral. Heredia was one of the 23,934 Venezuelan citizens that waited patiently in line outside of the University of Miami's Watsco Center to participate in the symbolic referendum. According to the organizers, 30,000 people voted in two locations in Doral; 14,451 in Aventura; 16,848 in Weston, 13,044 in Fort Lauderdale and 4,473 in West Palm Beach. At the end of the day, 102,750 votes were cast in South Florida. The referendum, organized by the Venezuelan opposition, was celebrated simultaneously in the Latin American country and around the world. 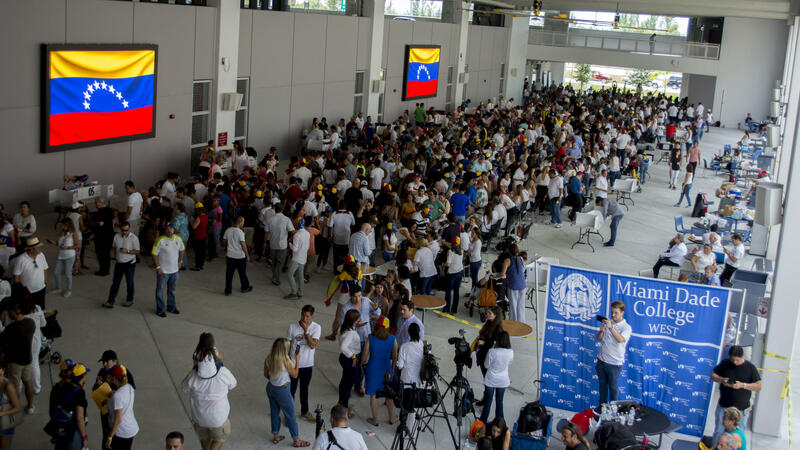 Citizens were invited to answer yes or no to three questions, dealing with Maduro's call for a new Constitutional Assembly, the recent role of the Bolivarian National Guard in repressing protests inside the country and the renewal of government powers. The results of this vote are not binding but that didn't dampen the spirits of the participants in South Florida, who sang, danced and cheered while they waited patiently -sometimes for more than an hour- under the unforgiving South Florida sun. "Voters are very happy. People are euphoric. Yes, yes, yes for Venezuela," said Angel Rodriguez, one of the hundreds of volunteers assisting at ballot locations in Doral. "I got here about an hour and a half ago and I was a little overwhelmed with the lines, but it's for a good cause and you just have to do it. Being away from Venezuela, I can't be there on the streets so this is part of me giving back to my country," said Heredia while waiting in line in Coral Gables. This is the first time that Venezuelans in South Florida have had the opportunity to participate in a popular vote since 2012, when the government in Caracas closed the consulate in Miami. Ever since, citizens willing to vote in elections have had to travel to the consulate in New Orleans. "I am here to vote, I am trying to get this government out of our country," said Barbara Aguilar, 41, while waiting in line at the Coral Gables location with her husband and two young children. "I am sure that my vote is going to make a difference." On Sunday, Venezuelans and Venezuelan expats will hold a vote that’s expected to send a strong message to President Nicolás Maduro: Don’t rewrite Venezuela’s constitution. In South Florida, the campaigning got under way on Thursday with a conference of Venezuelan voices in Coral Gables. 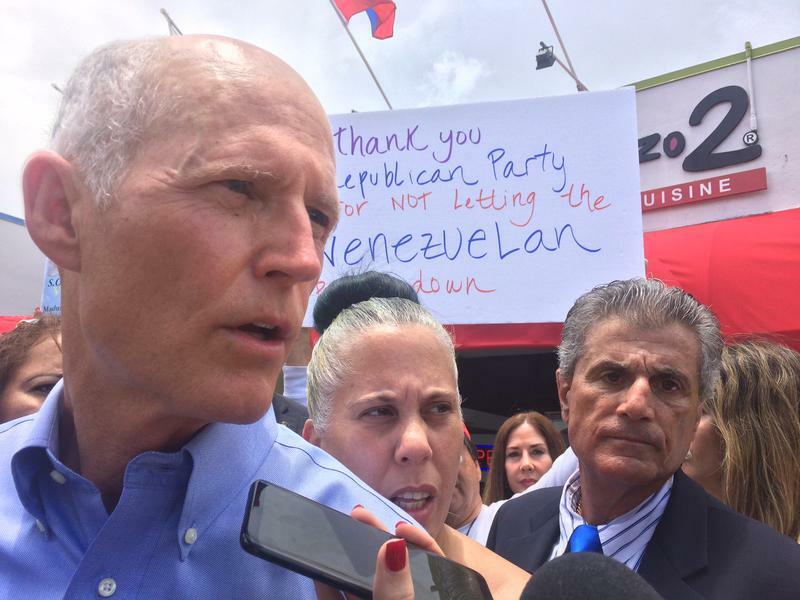 Florida Governor Rick Scott returned to Doral this Monday for another "Freedom Rally" in support of the Venezuelan opposition and committed to taking measures so that the state of Florida will stop doing business with companies associated with the Venezuelan government. "Any organization that does business with the [Nicolas] Maduro regime cannot do business with the state of Florida," said Gov. Scott to the crowd gathered at the Venezuelan restaurant El Arepazo Dos. Scott said he will present the idea to the members of his Cabinet in August. 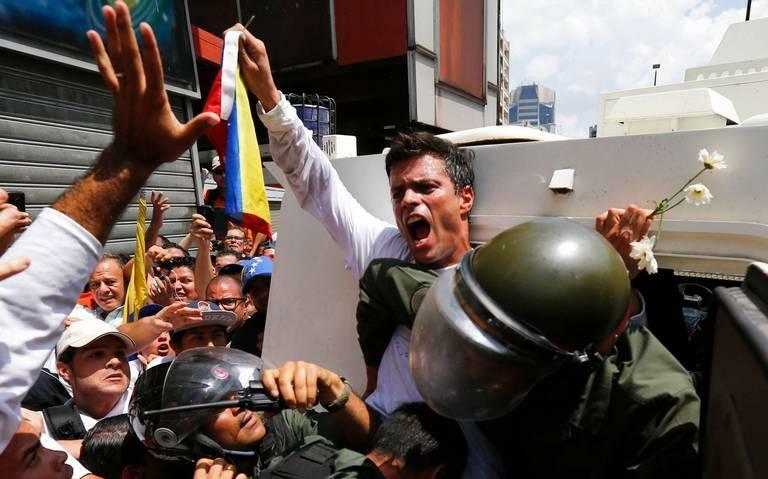 Venezuelan opposition leader Leopoldo López was released from prison over the weekend. 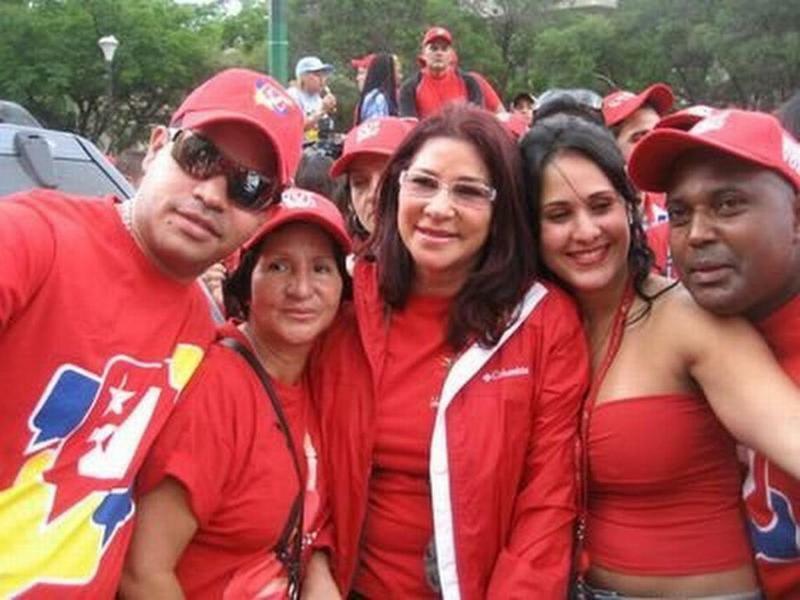 But that doesn’t change the fact that Venezuela’s unpopular socialist government remains firmly in power – thanks largely to the loyalty of Venezuela’s military leaders. Many of those top brass are accused of having links to drug trafficking – and they fear that if President Nicolás Maduro is overthrown, they’ll have to face justice. Venezuelan opposition leader Leopoldo López, who's seen as a symbol of anti-government protests, has been released from prison and put under house arrest, the country’s Supreme Court confirmed Saturday. The news out of Venezuela isn’t getting any better, with no resolution in sight to help the political and economic crisis. Meantime, food and medicine can still be hard to find, and street protests are now regular. This week also saw a group of government supporters attack opposition lawmakers with wooden sticks and metal bars, while national guardsmen stood by. So, more Venezuelans are leaving, building communities elsewhere, including in places like Mexico City.